There are many reasons why dentists should offer appointment request and new patient forms online. Online forms, in general, are more efficient than paper forms. They eliminate the cost of printing and scanning and make edits quick and easy. You also don’t have to file forms, freeing up valuable time and space, and when you use online forms, it’s possible to receive your patient’s information before their appointment time, making it easier for you to prepare. Other important points such as built-in HIPAA compliance (offered by Hush Secure Forms) and no longer having to interpret poor handwriting give dentists more than enough reasons to move beyond paper forms once and for all. But even if all of these reasons didn’t exist, there is still the No. 1 reason for moving your paper forms online—patient satisfaction. Online forms make everything so much easier for your patients. Patients are relying on the internet more than ever to find and make contact with healthcare providers. Dentists are no exception. If a potential patient is unable to make contact with a dentist online, whenever and wherever it’s convenient for them, there’s a very good chance that they’ll move on. It used to be challenging to find forms that worked well, looked good, and provided the security you needed if patients sent and received protected health information (PHI). This is no longer the case. Hush Secure Forms gives healthcare practitioners the ability to easily build their forms with a drag-and-drop form builder or choose from a directory of ready-made templates that can be customized. The forms are easy to build and fill out, and they’re HIPAA compliant. They’re also very affordable. 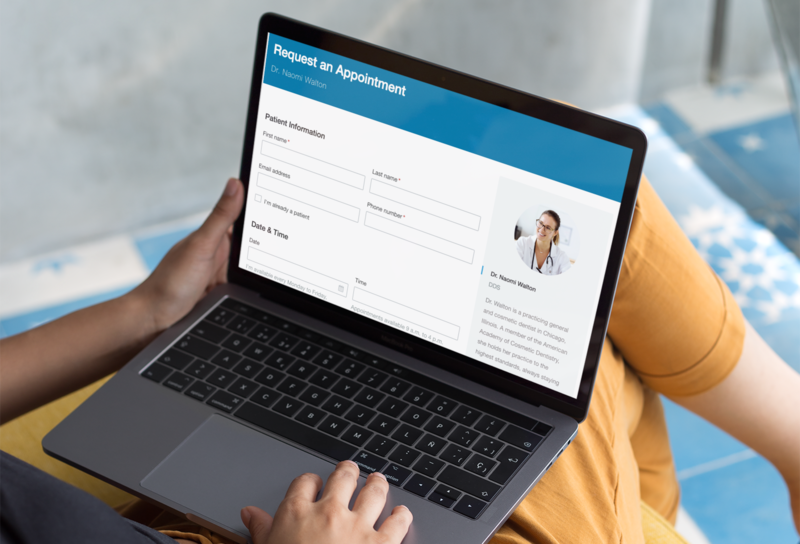 Now that we’ve removed all the barriers to moving your forms online, let’s take a look at all the ways online appointment and new patient forms can make your patients’ lives so much easier. It’s important to understand, online forms are an extension of your marketing, and the most successful marketing solves an urgent problem. When it comes to a dental practice, you can take these marketing words of wisdom literally. If a patient is in pain or discomfort, they want relief fast. Or perhaps a patient has moved and is in the middle of lining up all those necessary pieces of a new life - a new home, a new primary care physician, and a new dentist. This scenario can be highly stressful, and if you can be the dentist that alleviates even a fraction of that stress, there’s a good chance you’ll have a new patient. Anything you can do to eliminate friction or stress from a potential patient’s life will be a huge incentive for them to reach out to you. Online appointment and new patient forms that are easy to fill out make contacting you effortless for the patient. If you have a nicely built website with engaging content, many patients will want to reach out while they’re thinking about it and fill out their forms right after they read why you’re the best dentist for them. Imagine your typical patient’s life. It’s likely a little like yours - filled with appointments, professional pursuits, family time, and hobbies. If you can make it easy for a potential patient to check something off their list (their bi-annual dental cleaning, for example), the more likely you are to get their business. Patients can quickly make an appointment online and then take their time filling out the new patient form. No more rushing through filling out paper forms just before their appointment. Your patients are on the go just like you are, making it extra convenient to be able to fill out their forms anywhere and on any device. Online forms can be filled out on a computer, phone, or a tablet. Once they make their appointment with you, your patient will be able to fill out their new patient form while they’re in a checkout line, commuting to work, during their lunch break, or anywhere else that suits their busy schedule. When your forms are where your patients are, that tells them you’re thinking of their convenience and want to make sure their experience with your office is an exemplary one. And that’s before they even step through your door. Just like all of us, your patients are aware of the ongoing threat of security breaches, and they know the convenience of online communication can come with the price of exposure to this threat. If you’re using HIPAA-compliant forms, your patients can have complete peace of mind knowing that their personal information is protected. Hush Secure Forms protects the information passed back and forth through its forms with OpenPGP encryption that protects data during transit and in storage. When you’re using our forms, you can confidently assure your patients that their information is safe. Our Request an Appointment - Dental and New Dental Patient forms are ready for you to add your bio or edit the wording so they’re customized. When you make these forms available to your patients online, you’re giving them the immediate steps to effortlessly make their appointment, submit the required patient information, and receive the care they need. Try out the new dental forms today! Patient satisfaction is the No. 1 reason for moving your dental practice forms online. Patients no longer need to rush to complete forms before an appointment, they can reach out immediately and fill out forms anytime and anywhere, and they have peace of mind knowing their information is protected when they use Hush Secure Forms. Enter your email address in the box below to receive regular updates.